Ascending Butterfly: #ThrowbackThursday - The #HappyHalloween & How to Stump Serial Killer Jason Edition! #ThrowbackThursday - The #HappyHalloween & How to Stump Serial Killer Jason Edition! Happy Throwback Thursday Butterflies! In honor of Halloween I just couldn't resist sharing one of my favorite Halloween Photos from childhood. Check me out dressed as Josie from Josie and the Pussycats! Do you remember that cartoon? 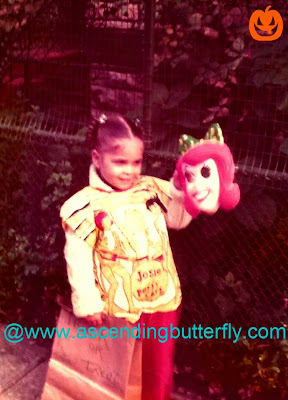 HAPPY HALLOWEEN BUTTERFLIES! ARE YOU DRESSING UP TODAY? FTC Disclosure: This is NOT a sponsored/compensated post, just some Halloween fun! OMG ! this gives new meaning to matching your outfit. 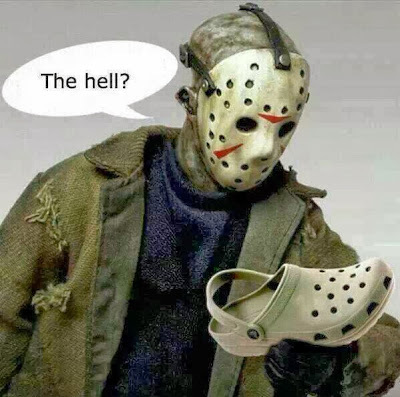 matching your mask and clogs now that a fashion no- no. LOL ! !